"Problematic video game use (PVGU), or addiction-like use of video games, is associated with negative physical and mental health problems as well as problems in social and occupational functioning. However, studies on video games in general, and PVGU more specifically, are few in number. Existing studies independently identify several contributors to PVGU. In the current study, the contributors to PVGU were studied simultaneously in order to enhance understanding of the mechanisms by which these risk factors can lead to PVGU. We found that ADHD symptomatology, cigarette use, and quantity of video game use all contribute to PVGU. Furthermore, we found that the effects of the combined predictors on PVGU are large, suggesting that considering these multiple factors in combination is a useful approach to the assessment and treatment of PVGU. Tracking these variables together may be helpful for clinicians treating clients with PVGU or who are at risk for PVGU." Lee, H. J., Tran, D. D., Bennett, N., Cosanella, T., Youkhaneh, N., & Morrell, H. E. R. (2018, April). Smoking, ADHD, and problematic video game use: A structural modeling approach. 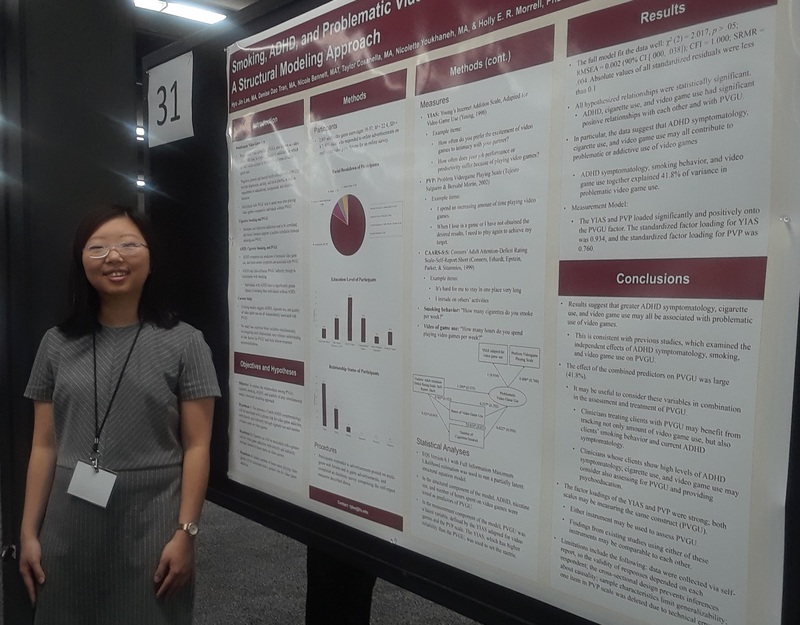 Poster presented at the Annual Meeting of the Western Psychological Association, Portland, OR.